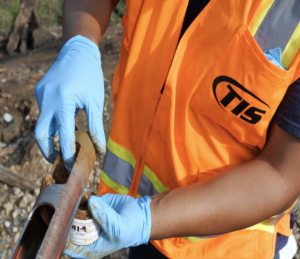 Two TIS employees mobilized to Meridian, Mississippi on November 6, 2017 to conduct Direct-To-Locomotive (DTL) soil sampling near the Mississippi cities of Louisville, Union, and Meridian. 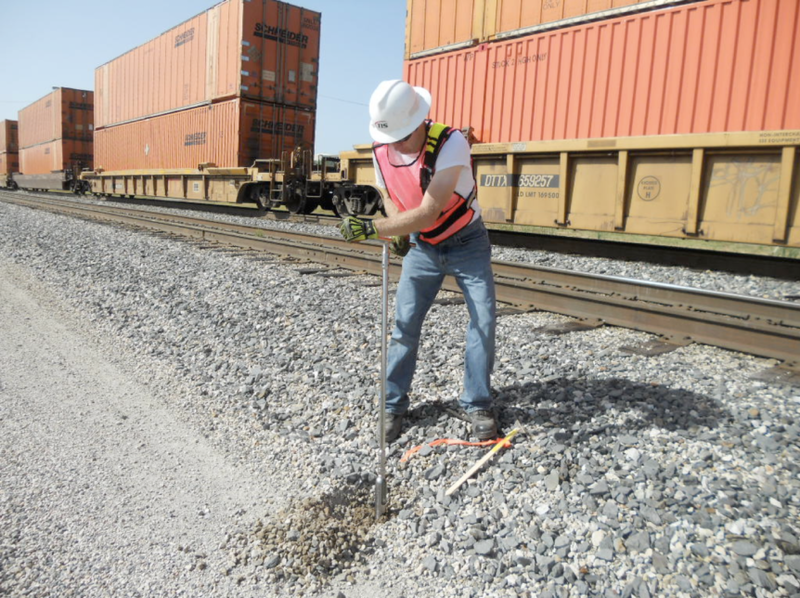 The soil sampling at each location was performed along the railroad track where DTL fueling takes place. 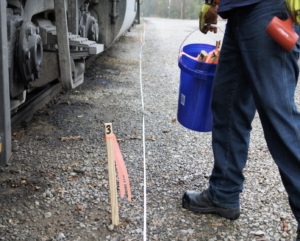 This soil sampling project helps to ensure that the contracted fuel vendors are not contaminating the railroad track by spilling or leaking diesel fuel in the designated DTL fueling area. The sampling procedure began by plotting sampling boring locations at each site. Once each sampling location was plotted, approximately two-feet of ballast was removed via shovel to gain access to the soil surface. A stainless-steel hand auger with a 3 1/4-inch diameter sample retrieval device was advanced through the soil to obtain the soil samples. This tool was driven one foot, below grade, into the soil after ballast was removed. After each sample was collected with the hand auger, it was containerized directly into 2-oz sterile sample jars. Each site included 10 sample locations. The hand auger was decontaminated in an Alconox and distilled water solution after each sample location to prevent cross-contamination between samples. Additionally, Nitrile gloves were used and replaced by employees at every bore site. Once the samples were collected, a chain-of-custody was completed for each site. The sample jars were then labeled, sealed, and placed in coolers on ice, and shipped to an accredited laboratory on November 8, 2017 for analysis. Each soil sample was submitted for Diesel Range Organics (DRO) analysis.